The 2017 Arizona Fall League (AFL) starts on October 10, with plenty of names to be excited about. For those unfamilar, the AFL is an MLB-sponsored developmental league where each MLB club sends a half-dozen or so players who compete in a six-week schedule. In 2017, several top position player prospects will certainly receive the headlines, but just as many unheralded names are hoping to put themselves on the map. Similar to most seasons, the pitching ranks are a bit thin, but plenty of hard throwers on rosters will touch triple-digits on radar guns. In preparation, BaseballHQ.com profiles each AFL roster with a fantasy spin below. We indentify the top position prospect, top pitching prospect, and a sleeper on each of the six squads. The BaseballHQ.com minors team—Rob Gordon, Chris Blessing, and Jeremy Deloney—contributed to the report. And of course, we want you to remember our First Pitch Arizona weekend conference in Phoenix on November 2-5. In addition to many different seminars and panels where you can interact with industry leaders and like-minded fantasy baseballers all weekend long, the conference includes tickets to four AFL games so you can do you own first-hand analysis, and find that kery prospect before your league competitors. The conference still has a few spots available; check out our First Pitch Arizona web page for details. Issues to Watch: Mesa will field a very impressive lineup on a daily basis and includes some of the top names in the league. There is plenty to like in the infield, highlighted by Sheldon Neuse (3B, OAK) and Yordan Alvarez (1B, HOU). The outfield is set with the likes of Victor Robles (OF, WAS) and Kyle Tucker (OF, HOU), two of the top prospects in baseball. The catchers are no slouches either. While the starting rotation and bullpen aren’t exactly littered with top names, there are a number of hard-throwing relievers that could turn heads. As always, the pitching staff includes a number of arms who missed time throughout the season. The AFL gives them an opportunity to get regular work and return to game action. Alec Mills (RHP, CHC) is one such pitcher. Though not a top prospect, he gives the Cubs a versatile arm for 2018. The Athletics and Astros both sent an intriguing mix of players to the AFL and they will be watching intently. Best Position Prospect: On a prospect-laden roster, Victor Robles (OF, WAS) still stands out as the best of the lot. The 20-year-old has all the ingredients and tools to be a perennial All-Star. With a .300/.382/.493 line with 10 HR and 27 SB between High-A and Double-A, the right-handed hitter was summoned to the big leagues as a September call-up. 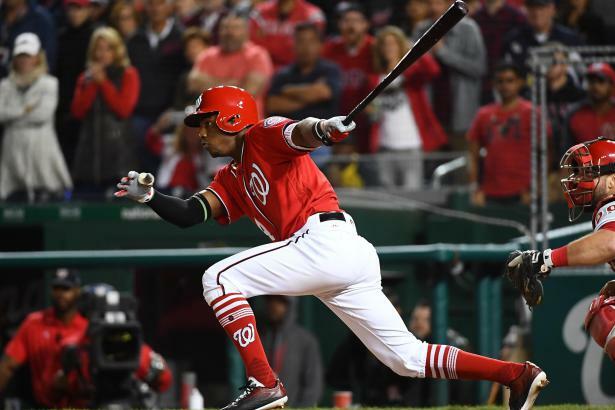 While he received a decent amount of time down the stretch, the Nationals will be interested to see how he continues to develop in the power department. He established a new career-high in HR in 2017 and he has the bat speed and natural strength to eventually hit 20+ HR down the road. Best Pitching Prospect: Logan Shore (RHP, OAK) was a 2nd round pick in 2016 due to his change-up and advanced command. He missed two months during the season due to a lat injury and he’ll attempt to get back in the groove in the AFL. The 22-year-old was dynamite the last month of the season, using his lethal sinker and plus change-up to keep hitters at bay. He’ll work on improving and polishing his slider which ranks as a distant third pitch. His change-up may be one of the top offspeed pitches in the minors. A BaseballHQ.com subscription unlocks articles like these all season—and off-season—long. Get the edge for 2018 in your league! Subscribe to BaseballHQ.com. Issues to Watch: Prospect followers may not be overly impressed with the roster, but there are a number of under-the-radar guys who have a chance to open eyes with solid performances. The Cardinals, for example, have amassed quite a bit of young talent in their organization, but didn’t send any of their best prospects to the AFL. However, the prospects they sent are still quite good in their own right. Sandy Alcantara (RHP, STL) and Jordan Hicks (RHP, STL) have double-plus fastballs in their arsenals. Edmundo Sosa (INF, STL) and Oscar Mercado (OF, STL) have legitimate chances to evolve into everyday players. Tyler Jay (LHP, MIN) was a first round pick in 2015, but rarely pitched in 2017 due to a shoulder injury. The Twins seem poised to keep him in the bullpen long-term. The biggest strength on the roster is the collection of infielders, led by Brandon Lowe (2B, TAM), Chris Paul (3B, MIN), Nicky Lopez (SS), and Sosa. Best Position Prospect: The roster is bereft of high-ceiling talent, but Yanio Perez (OF, TEX) is an exciting prospect who excelled in his first season in the US after signing out of Cuba in September 2016. He hit .280/.343/.434 between Low-A and High-A and he just turned 22 in August. The right-handed hitter has terrific power to all fields and he runs well. Adding to the intrigue is his ability to play multiple positions. He is listed as an outfielder and will likely work on perfecting his craft there in the AFL. He has also seen game action at 1B and 3B. His strong arm works very well in RF. Best Pitching Prospect: Blessed with one of the best pure arms in the minors, Sandy Alcantara (RHP, STL) will head to the AFL with the specific task of working on his secondary offerings. He pitched in Double-A with moderate success before his recall to the majors on September 1. He has since pitched out of the bullpen after serving as a starter in the minors. The just-turned 22-year-old has a long, lean frame and can reach triple-digits on the gun. Outside of his fastball, however, he needs to hone his raw change-up and inconsistent curveball. He has the stuff to post high strikeout rates, but he only had 106 K in 125.1 innings (7.6 Dom) in 2017. Issues to Watch: Peoria, on paper, is one of the more interesting squads based on talent and issues to watch. Several prospects are trying to re-establish themselves as future MLB assets or recover from injuries. No better place to start than former top prospect Henry Owens (LHP, BOS). A top-50 prospect for many in 2014 & 2015, Owens struggled mightily in 2015 and 2016 stints with Boston. Alex Jackson (C, ATL) just finished his first pro season behind the plate. Limited to a few starts a week, the former Mariners top prospect will get quality reps, both behind the dish and at the plate. Kyle Lewis (OF, SEA) is a year removed from a serious knee injury. The former Mariners top pick will try to make up for lost development time after only in 49 games this past season. Max Pentecost (C, TOR), Lourdes Gurriel (2B, TOR) and TJ Zeuch (RHP, TOR) will get much needed reps after injury issues have cost each development time. Best Position Prospect: Ronald Acuna (OF, ATL) made many people believers this season. The 19-year-old wrecked minor league pitching on three levels, including a 54 game stint with Triple-A Gwinnett where he slashed .344/.393/.548 with 9 HRs and 11 SB. For the season, Acuna hit 21 HRs, 31 doubles, 8 triples and stole 44 bases. A true 5-star stud, the Braves want to test Acuna against the best minor leaguers in the Arizona Fall League. Best Pitching Prospect: Touki Toussaint (RHP, ATL) has been peaking as a prospect since the 2nd half of the 2016 season. Acquired by the Braves in June of 2015, Atlanta coaches completely reworked the young RHP’s delivery. Now throwing from a lower 3/4s slot, the results have improved substantially. His fastball has come alive, which has helped his plus-plus 12-6 curveball become a bigger weapon. The Braves hope Toussaint can improve his fastball command. His Ctl rose to 5.0 and his Cmd dropped to 2.0 during a seven-game sample size against Double-A competition. Issues to Watch: This year’s Scorpions squad lacks the excitement of last year’s team, which included breakout performances from stud prospects, including Gleyber Torres, Scott Kingery and James Kaprielian, and the much anticipated professional baseball debut of Tim Tebow. The Mets continue to send older minor leaguers to the fall league, including 29-year-old knuckleballer Mickey Jannis (RHP, NYM) and 28-year-old Kyle Regnault (LHP, NYM), who spent his first three professional seasons in the independent Can-Am League. While the Reds chose to send a bunch of position players struggling with the bat (Taylor Sparks, Brantley Bell and Blake Trahan), other teams chose to focus on the development of several more newsworthy players. Can Billy McKinney (OF, NYY), Matt Thaiss (1B, LAA), Steven Duggar (OF, SF) and Chris Shaw (OF, SF) become Scottsdale’s breakout stars in 2017? We’ll find out soon enough. Best Position Prospect: Estevan Florial (OF, NYY) went from interesting international Single-A prospect to future MLB star seemingly overnight. The 19-year-old LHH made quick work of Single-A and High-A, earning a Double-A playoff spot. Florial has 5-tool potential. Slashing .298/.372/.479 during the regular season, the future Yankees RF biggest tool is his bat speed. Florial has made tremendous strides turning this raw tool into something more refined. Still, there is work to be done and the Yankees hope he continues a spectacular 2017 season with a positive AFL experience. Best Pitching Prospect: Justus Sheffield (LHP, NYY) leads a Scottsdale starting staff with big names that have struggled a bit with injury and performance, like Tyler Beede (RHP, SF) and Dillon Tate (RHP, NYY). A former 1st round pick of the Indians, Sheffield performed well at every minor league level. Still, the 21-year-old has lacked a breakout campaign. He has four pitches that project as average or better offerings at maturity, including a low-to-mid 90s 2-seam fastball with plus bore and solid sink and a power slider with sharp, two-plane break. The Yankees hope going against the best collection of hitting prospects in the AFL will prepare Sheffield for battle against the AL East when called upon next season. Issues to Watch: The Desert Dogs have an interesting mix of young, projectable talent, strong OF play, and pitching depth that is close to being major league ready. On the mound, the Desert Dogs are led by Pirates top prospect Mitch Keller, Dylan Covey (RHP, CHW), and Elniery Garcia (LHP, PHI). Garcia lost 80 games due to a PED suspension, but has a good four-pitch mix highlighted by a mid-90s heater and is worth keeping an eye on. The Glendale squad has some intriguing relief prospects, including Argenis Angulo (RHP, CLE), Matt Foster (RHP, CHW), Trevor Bettencourt (RHP, PHI), and Luke Eubank (RHP, CLE). Bettencourt posted a 2.61 ERA with 10 saves and 11.7 K/9 and Eubank went 2-0 with a 0.82 ERA in 22 IP. On offense the Desert Dogs will have one of the better outfields in the AFL. Yusniel Diaz (OF, LA) is a toolsy Cuban prospect who hit .333 once he moved up to Double-A. D.J. Peters, a 4th round pick in 2016, slashed .276/.372/.514 with 27 HR in the CAL and at 6-6, 225 has plus raw power. Tito Polo (OF, CHW) raked at three different levels in 2017, hitting .301/.363/.442 with 34 SB. Finally Matt Beaty (OF, LA) doesn’t really have a clear position, but has a professional approach at the plate and hit .326/.378/.505 at Double-A. Best Position Prospect: Francisco Mejia (C, CLE) has quickly developed into the top catching prospect in baseball. The 21-year-old Mejia was signed out of the Dominican Republic for $350,000 with little fanfare and exploded onto the prospect scene in 2016 when he posted a 50-game hitting streak and slashed.342/.382/.514. The switch-hitting Mejia proved that 2016 was no fluke hitting .293 with 21 doubles and a career-high 14 home runs in 347 Double-A AB. Mejia moves well behind the plate with a plus arm, but still has work to do with conditioning and signal calling. The AFL will be a solid test for Mejia who wore down as the season progressed (.220/.282/.390 in the second half). Best Pitching Prospect: Mitch Keller (RHP, PIT) missed three weeks of action with a back injury, but was otherwise dominant, posting an 8-5 record with a 3.03 ERA and 32 BB/116 K in 116 IP between High-A and Double-A. The 21-year-old Keller has a plus fastball that sits at 93-96 with late sinking action. He mixes in an above-average curve, and usable changeup. Keller pounds the zone, inducing weak contact and in 2017 he limited opposing hitters to a .202 BAA. Keller’s assignment to the AFL after 23 regular season starts suggest that the Pirates might be looking at a mid-2018 MLB debut. Issues to Watch: The 2017 version of the Salt River Rafters will be one of the least star-studded squads in the desert this fall. Part of the lack of depth for the Rafters stems from the fact that the Diamondbacks, Orioles, and Marlins are three of the weakest systems in baseball and the Rockies opted to send only one of their top 15 prospects, Dom Nunez (C, COL). Fortunately the Brewers sent a nice contingent of position players in Corey Ray (OF) Lucas Erceg (3B), Jake Gatewood (1B), and Monte Harrison (OF). Harrison was a 2nd round pick in 2014 and had his best season to date, hitting .272 with 21 HR and 27 SB between Low and High-A. Erceg wasn’t able to repeat his breakout of 2016, but did have 35 doubles and 15 home runs in 506 AB. The Orioles did send their #6 prospect Ryan Mountcastle (IF, BAL) who hit .314 with 35 2B and 15 HR at High-A before struggling when promoted to Double-A. First base should be provide plenty of thump with Gatewood (40 2B and 15 HR) and Rockies 1B prospect Brian Mundell (.300 with 28 2B and 15 HR). The Orioles Keegan Aiken has good stuff, but was just 7-8 with a 4.14 ERA in his full-season debut. and Diamondbacks RHP Ryan Atkinson rarely breaks 90 mph, but managed to post a 3.30 ERA with 162 K in 141.2 IP across three levels despite walking 3.8/9. Best Position Prospect: Corey Ray (OF, MIL) was the 5th overall pick in the 2016 draft after a standout career at Louisville, but he’s yet to hit his stride as a professional. His career slash line now reads .238/.310/.368 with 214 K in 692 AB. Despite this slow start, Ray remains an elite athlete with across the board tools. Ray has a fluid left-handed stroke and should be to hit for average and power as he matures and the hitter-friendly AFL could be his time to breakout. Best Pitching Prospect: Dillon Peters (LHP, MIA) had an interesting 2017. The 5-9 lefty spent six weeks on the DL with a broken thumb, but was lights out when he returned to action, going 7-3 with a 1.57 ERA in 63 IP. That success didn’t translate once he got to the majors where he struggled in five late-season outings (0-2 with a 6.31 ERA). Peters does have a good, low-90s sinking fastball, but his secondary stuff is only average to slightly above. Because of his big league experience, Peters should fare well in the AFL and enters 2018 as likely back-end starter.